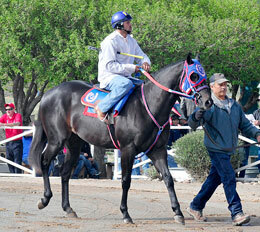 Ruidoso Downs held the first of three-days of schooling races for two-year-olds on Monday. RUIDOSO DOWNS, NM�MAY 5, 2014�Poison Ivory Effort, a son of leading sire IVORY JAMES, zipped 300 yards in :15.564 in the second of 12 schooling races at Ruidoso Downs on Monday morning to establish the fastest time of the day. An home-bred for Reed Land & Cattle, Co. LLC of Seminole, Oklahoma, the bay gelding is out of Effortless Jessie, by Mr Jess Perry. First Prize King, an $80,000 Ruidoso September Sales Yearling was timed in :15.858 seconds to post the 8th fastest time of the day. The IVORY JAMES colt is out of former Broodmare of the Year First Prize Dash, by Dash For Cash. Bred by Weetona Stanley, First Prize King races for Terry Stennett of Odessa, Texas. Videos of the schooling races and complete times are available through www.raceruidoso.com. The races are primarily filled with non-starting two-year-olds and are timed to be the final serious preparation for prospects in the trials to the Grade 1, $700,000 Ruidoso Futurity. Those 350-yard trials are held on May 22-23, the first two days of the summer season. The horses with the five-fastest times from each day of trials are eligible to race in the Ruidoso Futurity on June 8. The schooling races continue on Tuesday and Wednesday morning with the first race running at 8:30 a.m.